Fill the hand portion of a child’s mitten with one or two handfuls of rice, fill the rest of the way with cotton batting, be sure to fill thumb as well. Cut a scrap piece of material for scarf and gently tie around the mitten where the ribbing of the cuff meets the plain material of the mitten (end of the cuff). (When tying scarf, point the scarf material away from the thumb to make it appear as if the scarf is covering the person’s other arm.) Fold down cuff to cover scarf and form a turtle neck. Hot glue on wooden ball to top of turned down cuff. Glue on tiny plastic eyes or paint on with black acrylic paint. Use black marker for mouth. Gently dot on lipstick for cheeks by applying first to your finger and then dotting onto face. Glue 2 or 3 buttons to tummy area. 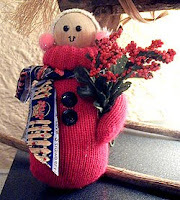 Glue a stem of holiday florals or greenery tucked into the arm (thumb), and glue arm to the mitten body. 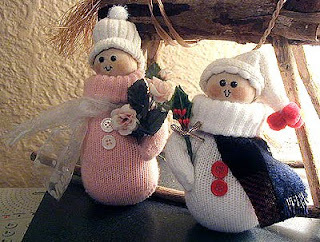 You can personalize each snow person with different hats, scarves, florals, and more. Our examples show how you can create an entire family of folks by simply using different colored mittens, scarves, and different styles of hats and ear muffs. Our Grandpa (pictured above) wears a top hat that is fashioned from a scrap of scarf. Lay your basic snowperson face up on your work surface. Lay a rectangular scrap flat and place under ball head. Fold a flap of the material up to form the brim of the hat (see photo) and begin gluing in place, wrapping around the head as you work. Glue final seams in the back of the hat so they are not visible. Amy and Peter are wearing snow hats. These hats are both fashioned from infant socks. To make Amy’s hat we simply fit the cuff of the sock onto her head and rolled up the edge of the cuff to form her hat brim. Then trim the end of the sock off and fold over neatly then glue in place. Glue a pom pom to the top. For Peter’s hat, put sock on head the same way as Amy’s, trim toe portion off, then cut the end of the sock into three sections. Pull those three sections together to form a cone type tip, glue three pom poms to that tip. Little Jessica is wearing earmuffs instead of a hat. We simply cut a scrap piece from the cuff of an infant’s sock and glued it across the top of her head. At the ends of the headband, glue two pom poms for the muffs. A slightly larger mitten was used for Mom and Dad. Because the cuffs of the mittens were much larger and thicker, we formed parka hoods by simply gluing the ball inside the cuff and gluing the “chin” to the mitten itself. 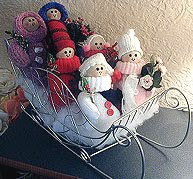 You can display these snow people in a basket with sprigs of greenery and holly berries, or place them in a sleigh. Fill the sleigh with cotton batting and place each family member in their seat. 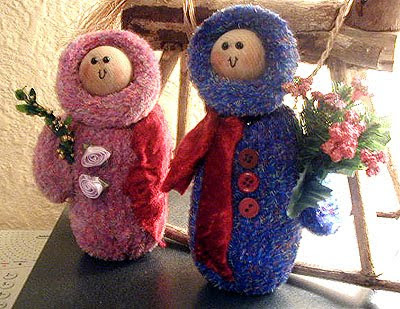 Place these cute little people on your fireplace mantel, or attach a piece of gold cord and hang from your tree or in your doorway.